There are many things to enjoy about life but something that many of us can truly appreciate is the ability to curl up and take a nice nap. It’s the perfect way to spend an afternoon and if we are able to find a comfortable spot, we might just find that it is harder to wake up than we first thought. You are about to find one of those spots. When it comes to comfort, there is nothing like sinking down into a beautiful pillow. Most of us have that perfect pillow that we use under our head and neck, and we probably wouldn’t trade it for anything in the world. Now it isn’t necessary to limit the pillow to only the top part of your body. Thanks to this wonderful invention, it is possible to enjoy having your entire body in a pillow that is almost too comfortable! 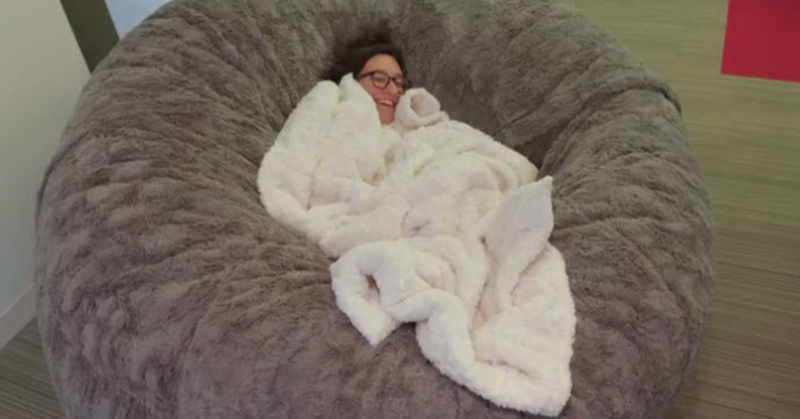 It is not only a pillow, it is also a sofa and it is made by Lovesac. The pillow is referred to as the Big One and when you see the pictures below, you are going to understand exactly why. This massive pillow is 3 feet tall and 8 feet wide, the perfect size for sinking into and enjoying 40 winks. In fact, if you are somebody that enjoys napping with your significant other or perhaps even your oversized dog, there is plenty of room. It will fit up to three adults comfortably! The Big One is not stuffed with the traditional beans that fill up a beanbag. It is filled with shredded Durafoam, so it does not get compressed over time and it absorbs your body weight quite nicely. Relaxation is nice but it is not cheap. The Big One is going to cost you about$1300 but when it comes to comfort, you really can’t put a price on it. It also comes in 80 styles so there is something out there for you. Of course, you may need to make room for this massive pillow in your home but it will be well worth it.